We started out at the Madeleine because we had promised our son a trip to Paris’ oldest toy store, Au Nain Bleu ,which has been in existence since 1836. We were disappointed though to find out that the store is currently undergoing a major renovation and had just a tiny display of toys stacked on top of each other. We left quickly and walked towards Rue Saint Honoré passing by the Passage Madeleine where we couldn’t resist to walk through and see the fantastic spring flower box that was right in the middle of the alley. There are a few specialty stores in this side street and a very nice cafe filled with the Rive Droite (right bank) fashion crowd. So, we hopped into a taxi and headed back to the Rive Gauche (left bank) and straight to the oldest department store in the city, Le Bon Marché, which is the favorite of many Parisians. Our son got his toy, a table football game, and then went back to the hotel for some lunch while we continued on to do some leche-vitrine (literally translated as window licking a.k.a. window-shopping) in St. Germain. We walked along the boutique-filled streets of Rue de Cherche-Midi, Rue de Vieux-Colombier, Rue du Four, Rue des Ste. Peres and Rue de Grenelle taking a short break for a cafe lunch at the neighborhood place, the Café de la Mairie, which is usually packed with writers and students filling the place with smoke, although now that all of indoor Paris is smoke-free, having a coffee indoors is a pleasure. We had a quick lunch – a tartine pain Poilâne (open-faced sandwich) for me and a salade nicoise for my husband. 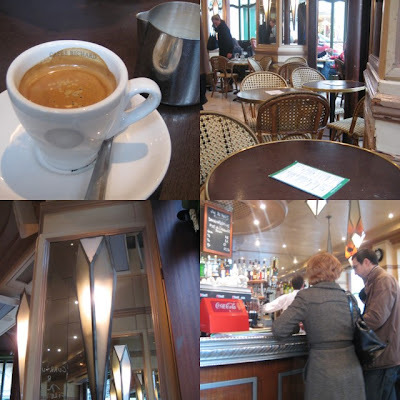 We walked around a bit more and stopped for a quick espresso at the other iconic café, Au Vieux Colombier, just on the corner of Rue du Vieux-Colombier and Rue de Rennes. Dinner that evening was supposed to be at 21, a seafood restaurant that I ate at in October, but when I called to reconfirm our booking, we were told that the restaurant had decided to close for Easter week and so we were without an evening reservation. We then decided to go to Le Bar du Plaza Athénée which was renovated a few years ago and has since become a trendy place to have a drink. After a quick drink in the modern clubby bar, we walked four blocks to Rue Marbeuf to have dinner at Meiji renovated a year ago from what used to be my favorite sushi place in Paris, Sushi-Cho. The interiors have been spruced up but the place pretty much looks the same except that they’ve streamlined the menu and concentrated only on sushi, sashimi and yakitori. Our dinner was excellent and the service was efficient. We ended the day with a short walk up the Champs-Élysées then it was back to the hotel.